There are many reasons to visit Copenhagen: beautiful architecture, bike-friendly streets, and calm canals that carve through the cityscape. However, one of the greatest reasons to visit Copenhagen is to eat the local food. Home to 28 Michelin-star restaurants, including NOMA (#1 restaurant in the world for 4 years), people travel to Copenhagen just to dive into the world of New Nordic cuisine. 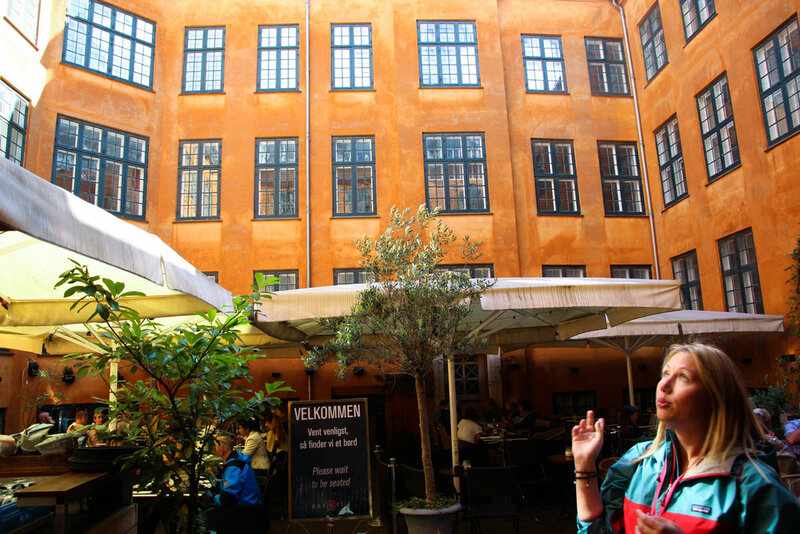 Taking a food tour with a local is the best gateway to the seemingly endless number of hygge cafes and restaurants in this little-big city. Perhaps biased being a food tour guide myself, I think there is no better way to explore a new place than eating my way through it, so I decided to join Nova Fairy Tales for a food tour of the city. 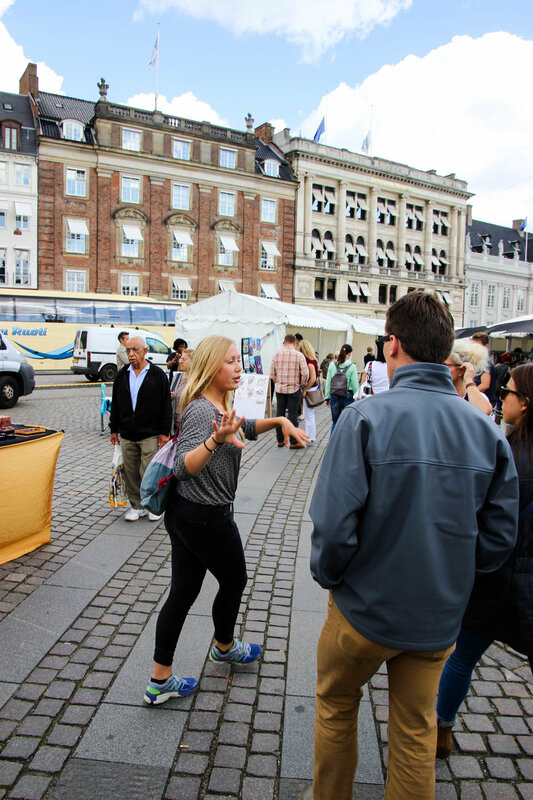 The 4-hour guided food tour through Copenhagen’s city center began at the Rundetaarn or Round Tower, which provides one of the best viewing points in the city. This astronomical observatory is one of many buildings constructed by Christian IV, the king of Denmark and Norway from 1588-1648 (59 years!). Legend has it that Christian IV ordered the construction of Rundetaarn without a staircase, so that his horses could carry his indolent-self to the top of the tower. Thus, a helical corridor leads guests to the top of the observation point for an expansive view over the flat city center. After orienting ourselves, our guide Sjaella walked us to one of the oldest butcher shops in Copenhagen. 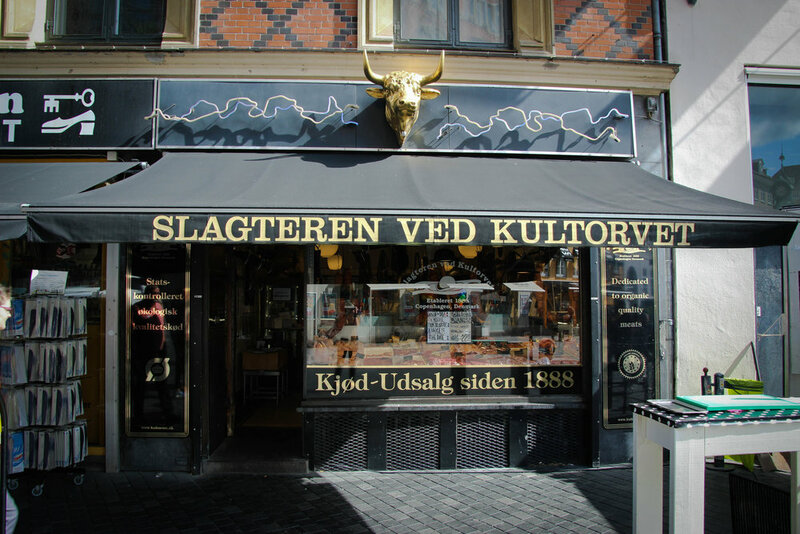 Slateren Ved Kultorvet (The Butcher at Kultorvet) has served the highest quality meat and poultry, produced by Danish famers, since 1888. All of the meat sold here is organic and produced on local farms. The butchers in the shop wear a traditional black bowler hat, and become enlivened with asked questions about their wares. We ventured around the corner to Slateren’s cheese shop to begin our first tasting. Osten ved Kultorvet is the only 100% organic cheese shop in all of Denmark. The shop has a small, curated selection of Danish cheeses, though it does import some high-quality cheeses from the other Nordic countries. The Danish, Swedish, and Norweigan cheeses that manager Mikael “Ost” Henriksen has selected for the shop showcase why organic cheese tastes better than conventional, factory-farm produced cheese, and is therefore worth the price. We tasted five cheeses in total, starting with the milder flavored cheeses and finishing the bold, smelly ones. The cheesemonger told us that these cheeses are best paired with some smørrebrød (rye bread), organic butter, fresh herbs, raw onion, and schnapps. 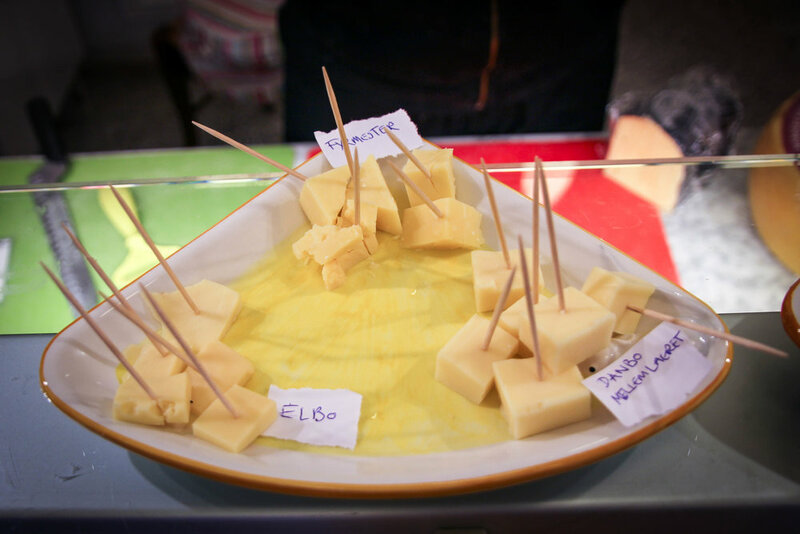 All of the cheeses selected came from cow milk, yet they varied greatly in taste and texture. The salt in the Danish air added a crystal-like crunchiness to one of my favorite cheeses in the cheese flight. Personally, I have a strong affinity for smelly cheeses, so I also gravitated towards the “Viking Blue” cheese. This blue cheese has a buttery creaminess to it, making it easy to spread on bread or eat by the spoonful (my true preference). Continuing onward, we walked past Rosenberg Castle, a Renaissance castle literally nestled in the city center. Surrounded by Denmark’s oldest royal garden, this is a popular spot for locals to gather and lounge on a temperate summer day. We arrived at 11:30 sharp, to watch the castle guards march out of the gates towards Amalienborg Palace for the changing the guard ceremony. After the traditional Danish procession, we stopped at a cozy spot for quintessential Danish food. Walking from ground level down a small staircase, we entered a restaurant specializing in smørrebrød. Smørrebrød is a dark rye bread filled with seeds, nuts, and kernels. It is also the perfect vessel for eating another Danish classic: pickled herring. Pickled herring is an integral part of Baltic, Nordic cuisine. The two step curing process begins with salting the herring, making it suitable for shipping. After it arrives at its destination and is ready for consumption, the herring is de-salted and pickled in a vinegar, salt, and sugar solution. 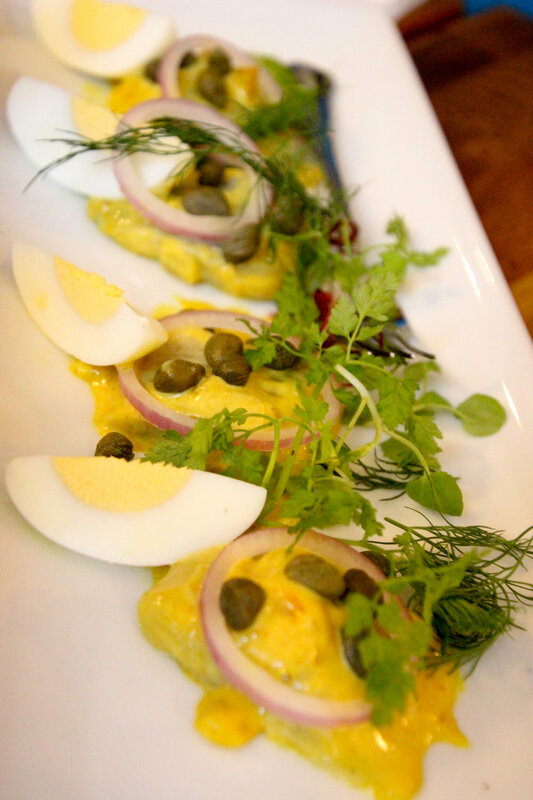 The tangy pickled herring we tried was smothered in a mustard sauce and paired with some fresh herbs and boiled eggs. Pickled herring may be an acquired taste, but truth be told, I cannot get enough of it. It was true love the first moment it met my taste buds. The second rye bread pairing came with Swedish meatballs made of pork, which came paired with some pickled cucumbers and red cabbage. Preserved foods are pervasive throughout Danish cuisine because they guarantee having salubrious foods year-round, no matter the unpredictable climate. After tasting some traditional and hearty Danish food, we transitioned to dessert to satisfy our sweet tooth. 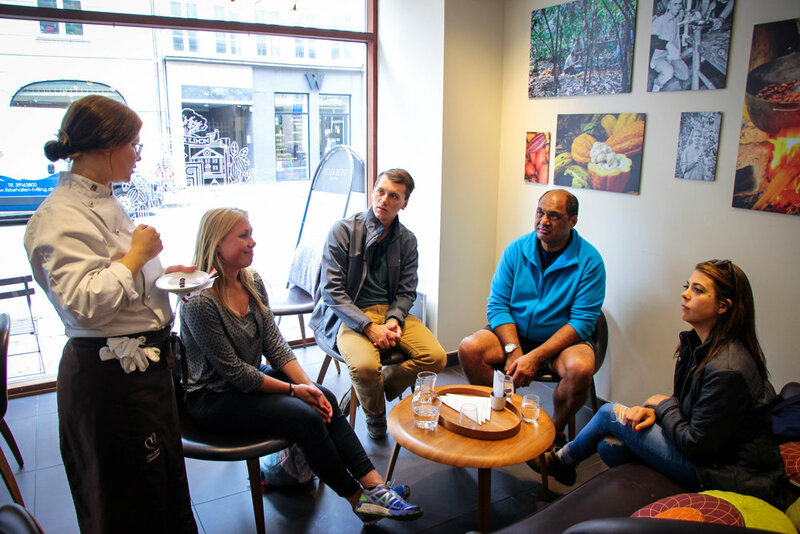 Denmark’s cool climate is conducive to chocolate making, which chocolatier Peter Beier wholeheartedly agrees to. The chocolate at Peter Beier’s chocolate shop is 100% handmade and uses cocoa beans from their own plantation. We tasted several single-origin chocolate pieces and truffles. Beier experiments with many flavors in his chocolates creating one-of-a-kind flavor profiles. 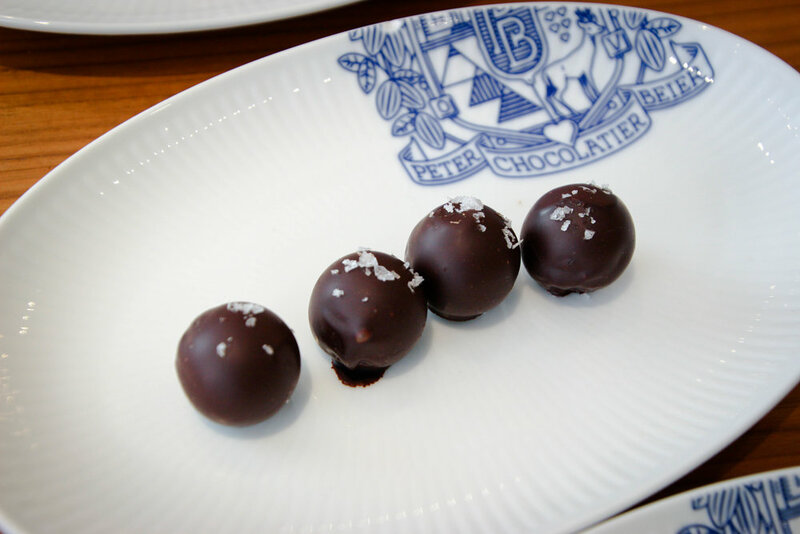 For example, he incorporates Carlsberg beer (a Danish beer) into one of his truffles. He is also not shy about using white chocolate. I particularly enjoyed the white chocolate and nougat pyramid with hazelnut. After sauntering through the city center, we headed to a food cart, which served hot dogs: one of the most popular (if not the most popular) street food in Copenhagen. 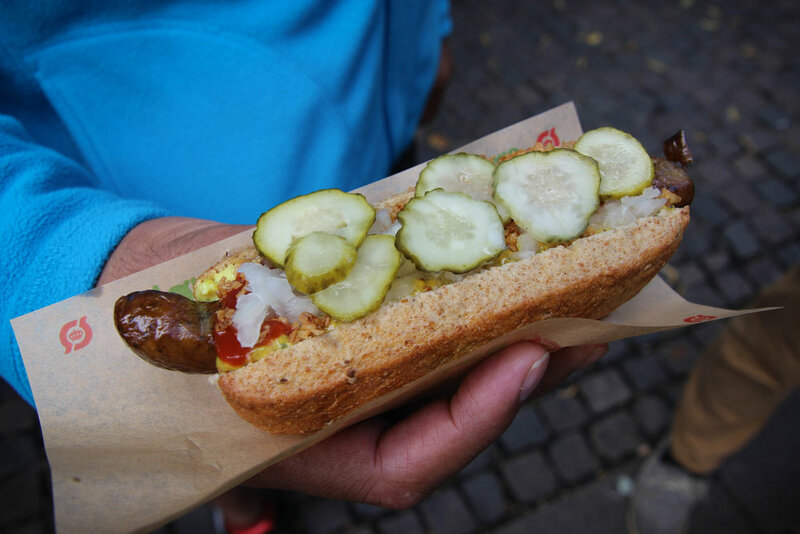 Out of many hot dog vendors in Copenhagen, our guide directed us to one particular street stand because it only serves organic meats. I actually opted for the vegan dog, which came with turnip mash and pickled beets. Consuming pork and dairy on a daily basis while in Copenhagen, I welcomed this this vegan option. Everyone on the tour ordered a different sausage (pork, veal, and lamb were other options) and we ate our hot dogs standing- as the locals do- so we could watch people stroll through the busy corridor. For our final tasting, we headed into an unassuming door and entered a gorgeous courtyard for a beer flight tasting. Surrounded by buildings with burnt orange facades, we made several toasts to finish off this delectable and delightful food tour. To join a Nova Fairy Tales Food Tour during your stay in Copenhagen, you can visit their website for information and to book tickets. For any other inquiries, email: hello@novafairytales.dk.